Made from an acrylic, nylon and Kevlar blend with leather palms, the Ansell Vantage 70-766 Leather Palm Grip Gloves protect the palms from abrasion, cut, tear and puncture, as well as offer excellent grip in oily environments. These gloves are ideal for manual handling tasks, particularly those involving heavy or oily components. The Ansell Vantage 70-766 Gloves feature leather palms for added protection and longevity. The incorporation of leather palms reduces the chance of abrasion, cut, tear and puncture, and enhances gripping ability in oily environments. The design of the Vantage 70-766 Gloves has been altered to improve the level of protection provided. Changes include reinforcement of the thumbs and relocation of the seams to the backs of the fingers. This redesign not only enhances protection against cuts and puncture, but also extends the life of the gloves. 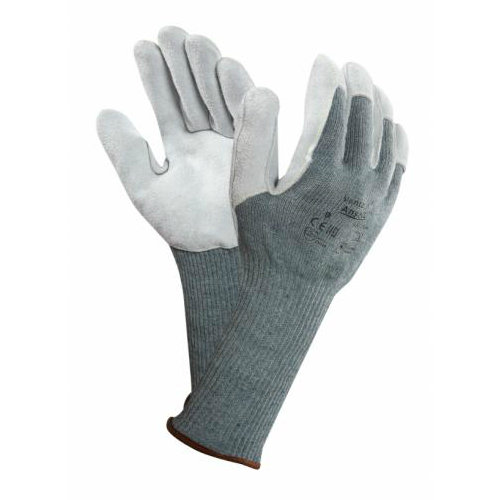 The Vantage 70-766 Gloves are machine washable at 40°C. This enables them to be washed and reused many times. The 70-766 Grip Gloves have been tested to EN 407-5:2004 for their resistance to heat. They achieved a rating of X1XXXX, meaning that they provide protection against contact heat up to 100°C. The table below shows the test results of the 70-766 Gloves according to EN 388:2016 Mechanical Risk specifications. These gloves are available in a range of sizes, making them suitable for most users. Please consult the table below for details, then select the required size from the drop-down menu at the top of the page. The gloves have a length of 310-350mm.